George Alexander Gale was born in Quebec City on 24 June 1906, son of Robert Henry Gale (later the mayor of Vancouver) and Elma Gertrude Read. After the Gale family relocated to Vancouver, Gale attended Prince of Wales High School between 1920 and 1925. He then enrolled in University College at the University of Toronto, where he served as vice-president of the college's Literary and Athletic Society in 1928 and treasurer of the University College executive in 1929. After graduating from the University of Toronto with a BA in 1929, Gale enrolled at Osgoode Hall Law School. He articled with Donald, Mason, White and Foulds in Toronto and was called to the Bar in June 1932. Gale was admitted to partnership in the firm of Mason, Foulds, Davidson & Gale in 1944 and made a King's Counsel in 1945. 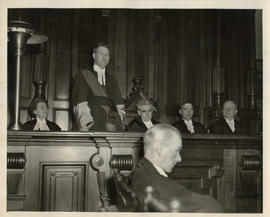 Gale remained with the firm until 28 October 1946, when he was appointed a Justice of the Supreme Court of Ontario, at the time believed to be the youngest person appointed to that position. He was appointed Chief Justice of the High Court of Justice for Ontario on 2 July 1964 and then Chief Justice of Ontario on 25 September 1967. He retired from the bench on 29 December 1976. Gale was appointed vice-chairman of the Ontario Law Reform Commission on 1 March 1977. In addition to his work as a lawyer and judge, Gale served on a variety of committees and boards, including the board of governors of the Ecumenical Foundation of Canada, the Ontario Advisory Committee on Confederation, the board of management of Beverley Lodge, the executive committee of the Canadian Judicial Council, the board of governors of Wycliffe College, the board of governors of Upper Canada College, and the Judicial Council for Provincial Judges. He was a honourary lecturer at Osgoode Hall Law School and the Faculty of Medicine at the University of Toronto, a warden at St. John's York Mills Anglican Church, a honourary president of the Ontario Curling Association, and a honourary member of the Canadian Corps of Commissionaires. He was also a member of the Lawyers' Club of Toronto, the University Club, the Toronto Curling Club, the York Club, the Delta Kappa Epsilon fraternity, and Phi Delta Phi. Gale was made a companion of the Order of Canada on 11 July 1977 and received honourary Doctor of Laws degrees from McMaster University (1978), York University (1979), and the University of Windsor (1980). George Gale died in Toronto on 25 July 1997. Fonds consists of records created and maintained by George Gale. The majority of the records relate to his career as a lawyer and judge, however, some items pertain to his personal and family life. The fonds includes scrapbooks, certificates, published writings, photographs, speeches, and artifacts. The records in the fonds were donated to the Archives by G. Robert W. Gale, eldest son of George Gale, in 2012. Fonds has been arranged in five series: certificates and memorabilia, photographs, publications, scrapbooks, speeches.